Dr. Sheldon Lee Cooper is one of Haruhi’s favorite TV show characters. Secretly, whenever she is done with all her chores for the day (including her errands for the host club), she comes home to a quiet apartment, quickly checks to make sure that nothing is out of place, and then reaches for the DVDs hidden behind their small television set. It isn’t Haruhi’s fault a classmate thought to lend her the first season. And it especially isn’t her fault that the show is easily very addicting. Of course, no one else is allowed to know. Except for said classmate who has already been discreetly compensated with offerings of Tamaki-senpai photos from the unreleased Angel Collection. Ironically, if somehow questioned, Haruhi would admit that she doesn’t always understand the DC or Marvel comic book references, or the convoluted manner in which the characters of the show speak. They’re physicists after all, complete with quantum dynamics and string theory coefficients, and Haruhi would also be the first to admit that she does not know everything. But, with frustrated conviction, she would nevertheless argue that that is not the reason why she adores Dr. Cooper so much. On the contrary, it is his irrationally human – or at times, inhuman – qualities which fascinate her. His obsessive compulsive personality disorder would be the perfect example. Haruhi effortlessly calls to mind one of her favorite scenes – Dr. Cooper in his element, explaining why the left side of the couch is his seat. "In the winter, the seat is close enough to the radiator to remain warm, and yet not so close as to cause perspiration. In the summer it is directly in the path of a cross breeze created by the open windows of his apartment. And it faces the television at an angle that is neither direct, thus discouraging conversation, nor so far wide to create a parallax distortion," she recites and means to continue, except her father has already slipped the key in and is about to unlock the door and Haruhi has to rush everything back into place so she doesn’t arouse suspicion. By the time she has finished the first season, the host club is busy preparing for the Angel Collection fundraiser. It consists of a modeling show, the unveiling of the title photo album, and a one-on-one with each of the hosts. As such, the music room is a mess, banners lying on the floor, purple glitter stuck to Hunny-senpai’s right cheek, Mori-senpai digging through fabrics on one side (because Tamaki-senpai has to have that soft silky design for his next costume). And Haruhi, while done with her assignments, has not had a proper meal yet. She has her lunch tucked beneath one arm, her school bag in the other hand, and a sullen expression on her face, scanning the supposedly large room for a place to sit. And there’s always a perfect place to sit. She just hasn’t found it yet. Tentatively, she eases next to the twins, who are arguing about hair color or a moe-moe centerfold, or something; Haruhi isn’t so sure and she may not really want to know. So she waits a few more minutes and when they refuse to settle down – Hikaru has his arm around Kaoru’s neck and Kaoru has a bottle of whatever-it-is in his hand – she gets up and looks for another seat. Right in time to avoid getting mauled by the Hitachiins and covered in green goop as a result. Tamaki-senpai is not as fortunate. She momentarily entertains the thought of sitting next to Hunny-senpai, except he’s chomping down on strawberry shortcakes like there’s no tomorrow and the icing is flying everywhere. Haruhi bites on her lower lip and glances towards Mori-senpai, who could have very well been a statue because the icing doesn’t seem to bother him. And well, those two really do have a world of their own. Which is why when Hunny-senpai notices her and waves her over to come take a seat, she gently though firmly shakes her head and moves on. Tamaki-senpai would make the ideal lunch partner. If only he didn’t talk so much. She counts three tablespoons (two and a half to be precise) as an average within ten minutes; the rest of the time distributed between a conversation about why Haruhi should not have a boyfriend until after graduation. And even then, she should be cautious. At some point, Tamaki-senpai loses focus and his monologue spans up to thirty minutes. 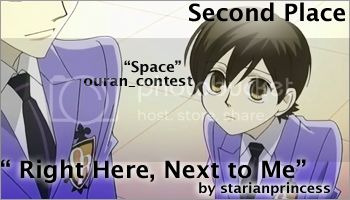 But by then, Haruhi has already slipped away and found refuge next to Kyouya-senpai - who carefully stares at his laptop screen as if it may contain the answers to the universe. Curiously, she leans over to ask what the fuss is all about and promptly falls forward in surprise when she realizes that her senpai is watching Episode 07, otherwise known as 'The Dumpling Paradox'. Kyouya taps a finger against her mouth before she manages to ask her question, "It just started," and places his spare headphones in her hand before she has time to wonder, "I think Dr. Sheldon Cooper is my favorite character." Haruhi nods and is going to voice her agreement when a familiar line catches her attention, "Who needs Halo when we can be regaled with the delightfully folksy tale of the whore of Omaha?," and she can’t help but smile because (a) there he is, all worldly and knowledgeable of the infinite, and (b) Kyouya-senpai is smiling, too. It may even be a grin. She ascertains her assumption that it is the perfect place to sit. Kyouya-senpai barely makes noise, the chair is close enough to the wall so as to not cause a glare yet is strategically positioned to garner enough light, it is neither too hot nor too cold, and it slightly faces the rest of the room so that they (or mostly her senpai) can keep a close watch on the rest of the club. She turns to Kyouya-senpai to tell him just that, prepared to channel Dr. Cooper, when he instead turns to her and raises a brow, "Speaking of TV shows, I’m at a loss. It appears that our photo album has been leaked to the public without my knowing and as I have already questioned the alleged distributor, I have my suspicions on the identity of our culprit." His grin widens and a chill fills the room, just as the twins accidentally knock a piece of cake on to Hunny-sempai’s Usa-chan.